I live in downtown Toronto about 2 blocks from the DVP. My backyard is a small (15'x85') and the 3 houses next to mine are the same. We have a large brick wall at the end of our yards and a large windbreak to the North, so the yards are very quiet, protected and sort of hidden. Today, March 28 2014, around noon, I saw what I think was a Broad Winged or Red Tailed Hawk perched on my fence just preening. I know he saw me as I went out with binoculars for a close up. I was maybe 40' away, I went inside to get my camera but he was gone when I went back out. I see plenty of hawks around here, but this was a first in my yard. Thank you, Steve, for your fabulous photograph of the hawk - I'm not sure what type it is, but I'm sure one of our readers will know! Comments for Broad Wing Hawk? I did spot a bird of prey as he was checking out my dog, I was looking for the red tail but didn't see one, and it was brownish/beige in colour, so I was wondering what kind it was. Located in Brampton, Ontario. That is a Red Tailed Hawk. Broad Winged do not have the red tail like that and other specific features this bird has. 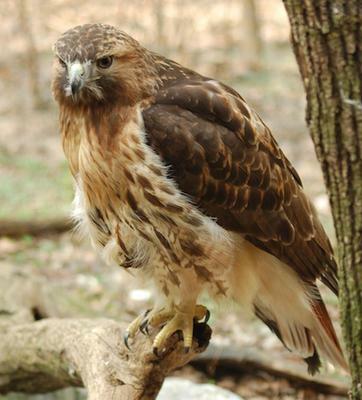 Beautiful Red tailed!!! Congrats - great capture.